Apes of the State to play at PSH on April 25! Thursday, April 25, 2019. Stacks Market Stage, Olmsted Building at 7:00 p.m. Go to our Facebook page to let us know you’re coming! Hailing from Lancaster, Pennsylvania, Apes of the State is a self-described “folk-pop-punk” group. Their first album, This City Isn’t Big Enough, debuted in 2016 and was followed with two national tours. Influenced by storyteller singer/songwriters such as Paul Baribeau and Everyone Except Me, Apes of the State’s music combines a straightforward, emotional, and lyrical style with the drive and power of a full acoustic band. The group features Dan Ebersole on the mandolin/guitar, Mollie Swartz on the violin, and April Hartman on the guitar/lead vocals. Their ever-changing sound is deeply rooted in punk rock, folk, and bluegrass, but with millennial sensibilities. Their songs explore love, heartbreak, student loan debt, regret, and overcoming addiction. As a band, they are driven by DIY ethics with a goal of helping as many people as possible with their music, and have been especially active in addiction recovery causes. Monday, April 22, 2019. Morrison Gallery, Reception: 5:00 p.m., Lecture: 5:30 p.m. Go to our Facebook page to let us know your’re coming! Whitney Phillips will provide a historical overview of the relationship between the news media and far-right manipulators who leveraged “trolling” and ”meme culture” during the 2016 U.S. presidential election. She will discuss the consequences of reporting on bigoted, damaging, or otherwise problematic information and the structural limitations of journalism (economic, labor, and cultural) that exacerbate these tensions. Phillips is assistant professor of communication and rhetorical studies at Syracuse University. She teaches classes in media literacy and online ethics; online discourse and controversy; folklore and digital culture; and lore surrounding monster narratives, urban legends, hoaxes, and crime. She is the author of This is Why We Can’t Have Nice Things: Mapping the Relationship between Online Trolling and Mainstream Culture (MIT, 2015) and the co-author of The Ambivalent Internet: Mischief, Oddity, and Antagonism Online with Ryan M. Milner of the College of Charleston (Polity, 2017). She is also the author of the three-part ethnographic report The Oxygen of Amplification: Better Practices for Reporting on Extremists, Antagonists, and Manipulators Online (Data & Society Media Manipulation Initiative, 2018). Phillips has published dozens of popular press pieces on digital culture and ethics in outlets such as The New York Times, The Atlantic, and Slate. 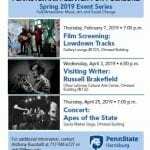 This event was jointly organized by the American studies program, the Pennsylvania Center for Folklore, and the School of Humanities at Penn State Harrisburg. Wednesday, April 3, 2019. Oliver LaGrone Cultural Arts Center, Olmsted Building at 6:00 p.m. Go to our Facebook page to let us know you’re coming! Russell Brakefield received his M.F.A. in poetry from the University of Michigan’s Helen Zell Writers’ Program. His writing has appeared in national journals and anthologies including The Southeast Review, The Literary Review, and BOMB magazine. He has received fellowships from the University of Michigan Musical Society, the Vermont Studio Center, and the National Parks Department. He teaches writing at the University Writing Program at the University of Denver. undoubtedly appeal to a wide audience. This event was jointly organized with the Penn State Harrisburg School of Humanities’ Visiting Writers Series. John Yetter Digital Collection back online! After a period of downtime to transition to our new website, the digitized portion of the John Yetter Photographs of Steelton, PA is back online! If you are interested to view the original materials from the full collection, please contact the PACF at folklore@psu.edu or the Penn Stae Harrisburg Archives at hna2@psu.edu. Come Study Folklore at Penn State! Don’t forget! Graduate applications to American Studies are due on January 15 (PHD) and February 15 (MA)! The Folklore and Ethnography certificate accepts applications on a rolling basis. See here for more information. PACF Spring Event Series Announced! 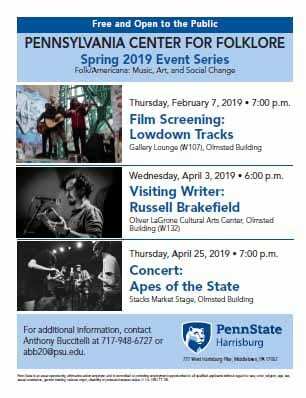 The Pennsylvania Center For Folklore is pleased to announce “Folk/Americana: Music, Art, and Social Change,” a series of free public events that will take place on Penn State Harrisburg campus in the Spring 2019 term. These events, organized around the concept of new takes on folk music and social change, will begin on Thursday, February 7, with a screening of the award-winning Canadian documentary Lowdown Tracks (2015). Download the attached flyers for more details. Please feel free to circulate these flyers widely. Summer Courses in Folklore and Ethnography are here! And here is a list of courses that can be taken for the Folklore and Ethnography Graduate Certificate program. For questions or further details, please contact Dr. Buccitelli. Simon Bronner is honored with the American Folklore Society’s Lifetime Achievement Award! At its recent annual meeting in Buffalo, NY, the American Folklore Society awarded Dr. Bronner with its highest prize: the Lifetime Scholarly Achievement Award. This annual award is given “in recognition of outstanding scholarly achievement over the course of a career.” Read more about it and see past winners here. Research into internet folk horror legends about Slenderman by PACF affiliated faculty Jeffery Tolbert was recently featured in Wired. Register now for spring courses in Folklore and Ethnography!